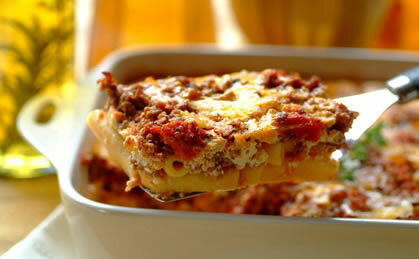 This great-tasting Italian dish is made using a pasta base filled with a delicious savoury mince. For the filling: Heat oil in a large frying pan. Add tomato paste, tomatoes, herbs and seasoning. Bring to the boil, then reduce heat and simmer for about 30 min. For the pasta base: Place the milk, water and margarine in a saucepan and bring to the boil. Add the sauce sachet and the pasta to this and simmer for 8-10 min, stirring occasionally. Lay the pasta in the bottom of an ovenproof dish, then place the mince mixture on top. For the topping: Mix the beaten eggs, milk and cheese together, pour over the mince and bake in the oven at 180C for 20-30 min. This entry was posted on May 28, 2010 at 7:11 am and is filed under Uncategorized with tags Decadent, Italian dish, Pasticco, Quick and easy, recipe, Savoury mince. You can follow any responses to this entry through the RSS 2.0 feed. You can leave a response, or trackback from your own site.